Texting while driving, emailing while driving and speaking on a phone while not using a headset are all against the law. Unfortunately, we see more and more people doing these sort of things on our roads these days. 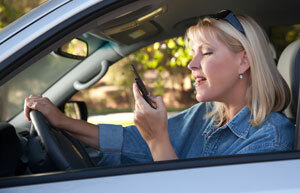 All of these actions fall in to the heading of "*distracted driving*". The personal injury lawyers at Goldfinger Injury Lawyers have been at the forefront of distracted driving law since it became so prominent. This is relatively new body of law as cell phones have only now become more popular and accessible in the past 15 years. Driving while operating a cell phone didn't used to be a big legal area back in the 1970's because nobody had cell phones back then. Today, it doesn't matter if you live in Toronto, London, or Peterborough, it seems that everyone, even grandma has a cell phone or a smart phone. The lawyers and staff at our firm understand that driving while operating a cell phone is extremely dangerous and has the potential of causing devastating accidents and catastrophic injuries. Some of our law firms most serious cases have come as a result of another driver operating his cell phone while trying to drive. We have recovered millions of dollars on behalf of victims of distracted drivers. We have also seen those at-fault drivers lose their licenses on account of their wrong doing. Brain injury, broken bones, crush injury, soft tissue injury and concussions are all common if somebody is paying more attention to their incoming emails rather than paying attention to what's happening in front of them on the road. Ontario has instituted separate laws to punish drivers who care more about using their cell phones or smart phones rather than driving safely. Goldfinger Injury Lawyers has worked to lobby government in order to establish even harsher penalties against distracted drivers because we've seen how these accidents can change peoples' lives along with their family dynamic. Our lawyers rank texting while driving, or operating a cell phone/smart phone while driving on the same plane as drunk or impaired driving. It's to be taken very seriously. We know that obtaining those cell phone and data records from the at fault driver will be very important to your case so that we can prove to the insurer, Judge and Jury that the at-fault driver was operating his smart phone instead of watching the road. These records can sometimes be very difficult to secure. But, our lawyers have the experience and know how to get the job done. Cell phone carriers will look to destroy these records, but our lawyers move quickly to make sure that they are preserved for your case. We also have the technical staff to decipher these records so that we can better understand them so that we can show the Court how wrong the other driver's behaviour was. This detailed approach helps strengthen your claims so that we maximize your claim instead of settling for less. 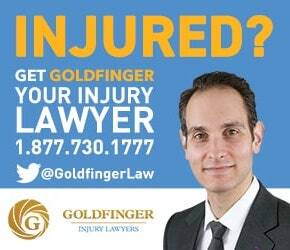 If you or a loved one has been injured on account of the negligence and complete disregard for the safety of others because they were driving while distracted by a cell phone, call Goldfinger Injury Lawyers today. Our lawyers have been handling these cases since cell phones became all the rage and found in the pockets of virtually everyone, young and old. We have been leading the way in Ontario to stop the practice of driving while operating a cell phone. All of our consultations are free, and you don't have to pay any money until your case settles. We would be pleased to meet with you and help get you the compensation which you deserve.